Ride the USA-Day 47: Epilogue | reDeploying! I’ve always liked this quote. We used it often in the 1990s to remind ourselves of why we redesign business processes…to get the same or better results in a different, more efficient manner. It came to me at the end of Monday’s very long ride through Olympic National Park as I reflected on that day of leaving and returning to the same place, and began to consider what it will feel like to return home after 47 days on the road. The Olympic Park experience was really a microcosm of my ride around the perimeter of the country with its ins and outs and the trials of running out of gas. 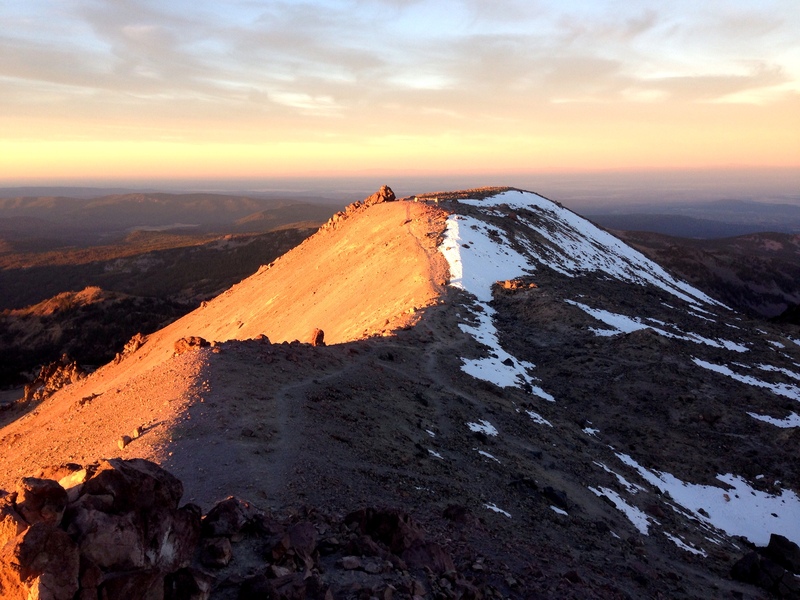 As I wrote yesterday, I’ve enjoyed Lassen Volcanic National Park for decades. 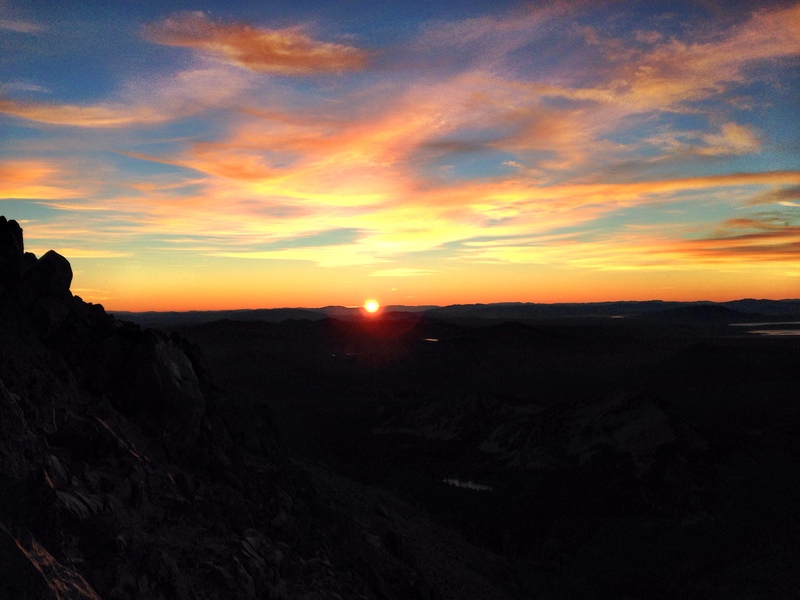 (I took the banner and other pictures included in this post on the morning of October 13, 2014, from the peak of Mt Lassen. That strange looking pyramid is the shadow of the mountain in the western atmosphere cast by the sun rising in the east.) Yet, when I returned there Wednesday I experienced it in a new way—influenced by the multitude of inputs I received while riding around the nation. I now have a different, broader context in which to view my surroundings and the people that inhabit them. 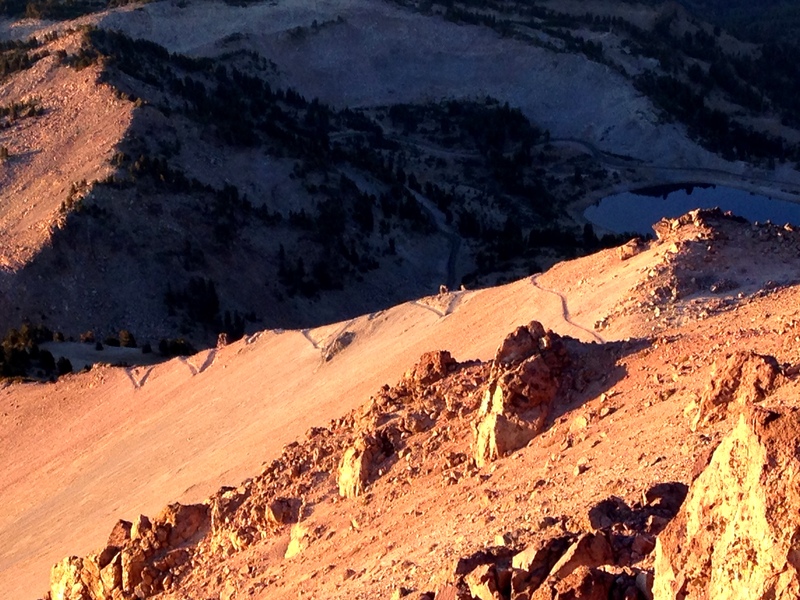 Lassen Park is even bigger and more magnificent than ever. I’ve seen the USA from the back roads, from the hearts of people I’ve met along the way. We live in a vast country with a multitude of climates and a very diverse population. I don’t think it’s possible to get a better vision of what and whom we are than by exploring in the open air of a motorcycle, and talking to anyone we meet with abandon. To do the ride solo brings yet another dimension to the experience. There were simply too many “coincidences” along my journey for me to deny God’s guidance and protection as I meandered along. He gave me strength when I doubted, made me laugh when I needed to, and spoke to me through the people I met along the way. 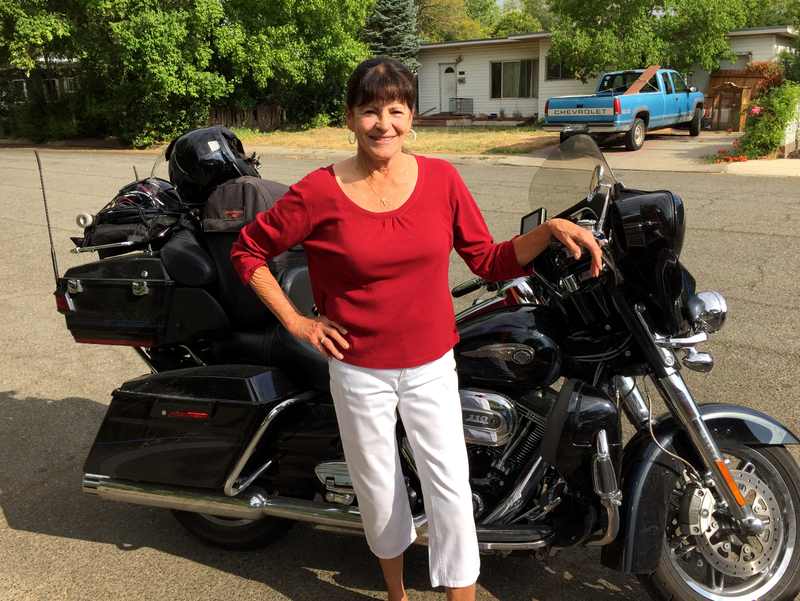 I decided to swing by my cousin, Dianne’s home in Red Bluff this morning on my way home, a little earlier than she was prepared for, to give her a hug and take her picture. I needed to do something today to continue the journey—to connect with family—and I’ve driven by Red Bluff too many times before without stopping. I’m really glad I did so this time. 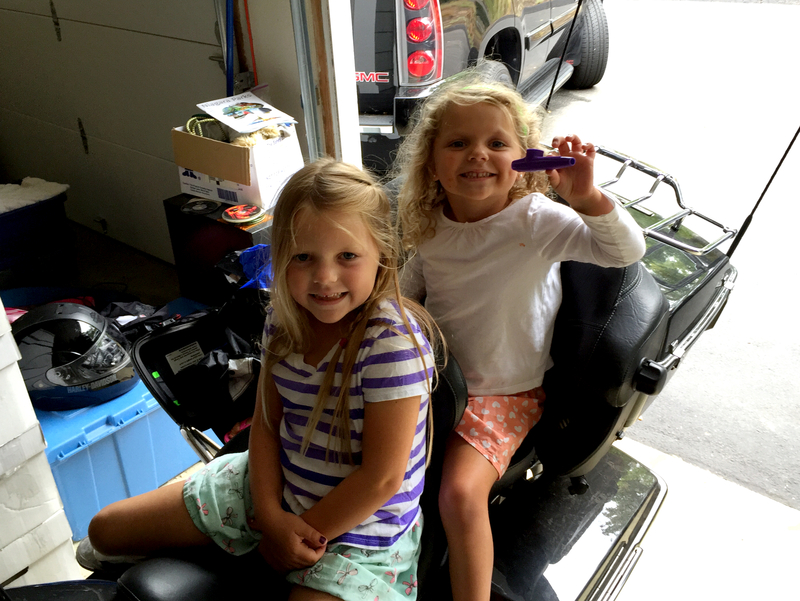 My granddaughters, Payton and Taylor, were so excited to see me when I rode into the driveway that they had to share in the experience by climbing onto my Harley. Thanks for being with me these past, nearly seven weeks. The fact that you followed my ride was a constant source of encouragement for which I am grateful. Special thanks to my wife of 40 years, Lisa, who made sacrifices so I could take this journey and supported me all the way. Thanks also to Dave, my riding buddy/coach who kept tabs on me nearly every day and sent reassurance when I needed it most. Here are the stats for today, followed by a brief summary of the trip. 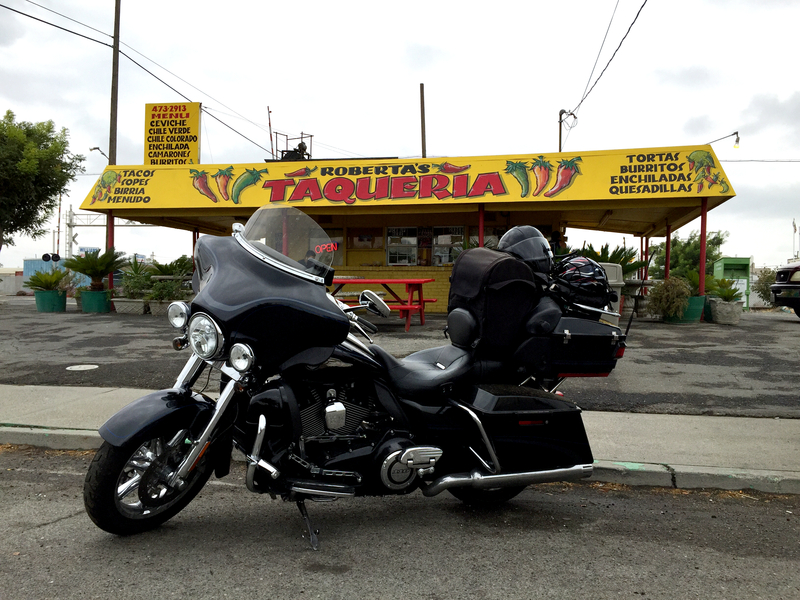 This entry was posted in Family & Friends, God, Harley Ride, Inspiration, Life, Road Trip and tagged Harley Ride, Road Trip, Shingletown by Gordon. Bookmark the permalink. (2) Please be sure my Gordon Lewis poster gets delivered soon ! Congratulations Gordon, on a great ride! I enjoyed reading your posts and most of all seeing you in West Palm. Welcome Home, Gordon. And thanks so much for sharing your journey with us. I loved the stories and the photos. Is there another trip in your future??? Love to you and Lisa. Gordon, Jim and I have so enjoyed your travels and stories and God encounters throughout your trip. Just a note of thanks for sharing your journey and sending you hugs, blessings, and love for you and the whole family! I am so proud of you dad. You are a constant source of inspiration to me. Tears as I read your last post. I can’t wait to see you and hear more in person soon. PS epic sunset photo !!! Meriwether Lewis would be proud to know that the exploratory qualities of the Lewis DNA is as strong as ever. Congratulations on safely completing this portion of your continuing journey.